Today we are going to talk about how to clean ivory, specifically how to clean ancient fossilized ivory, which is the only type of ivory we use in our Zealandia jewelry. We are passionately against new ivory of any kind as it destroys our earth’s precious living creatures. The fossilized mammoth and walrus ivory in Zealandia jewelry is hundreds to many thousands of years old. It is an ancient and treasured material that can be well preserved with proper cleaning and care. Cleaning ivory is similar to cleaning any other porous organic material. Fossilized ivory is not truly fossilized in that it is still somewhat hygroscopic – it reacts to the relative humidity in the air depending on where you live and the seasons. As it is slightly porous, we recommend sealing your ivory with a light coating of olive oil every six months to a year. Our artisans polish your piece of Zealandia jewelry with a jewelry polish before it reaches you, but over time this polish can become absorbed into the material. Sealing the fossilized ivory regularly with olive oil on a cotton swab will help to maintain a protective barrier against soiling. The second step to preserving your fossilized ivory’s natural organic color is to avoid any contact with chemicals, cleaners, and specifically silver polishing cloths/solutions. Cleaning ivory can become a chore once it has come in contact with the black tarnish that silver polishing cloths remove from sterling silver. Take care to only touch the silver with your polishing cloth and never run the cloth over the fossilized ivory portions of your jewelry piece. Do not wash your jewelry in any water, cleansers, or soaps. Keep this mantra in mind: organic fossilized ivory should only be treated with simple, organic products such as olive oil and rubbing alcohol. You won’t need much on hand if you’re wondering how to clean ivory once it has become dirty. A bottle of rubbing alcohol and a few cotton swabs should take care of any dirt or soiling that may have affected the fossilized ivory’s appearance. - Dip your cotton swab into the rubbing alcohol and gently squeeze out excess alcohol from the swab (you don’t need to saturate the ivory with alcohol to clean it). - Rub the fossilized ivory stain with the swab in circles until you see the stain lifting. - Change out the cotton swab as it become dirty and repeat as needed. The final step in preserving your fossilized ivory jewelry is to make sure it is stored out of direct sunlight/high heat and ideally in an air-tight bag that keeps it protected from air and moisture. The air-tight bag also helps preserve the sterling silver from tarnishing so quickly. 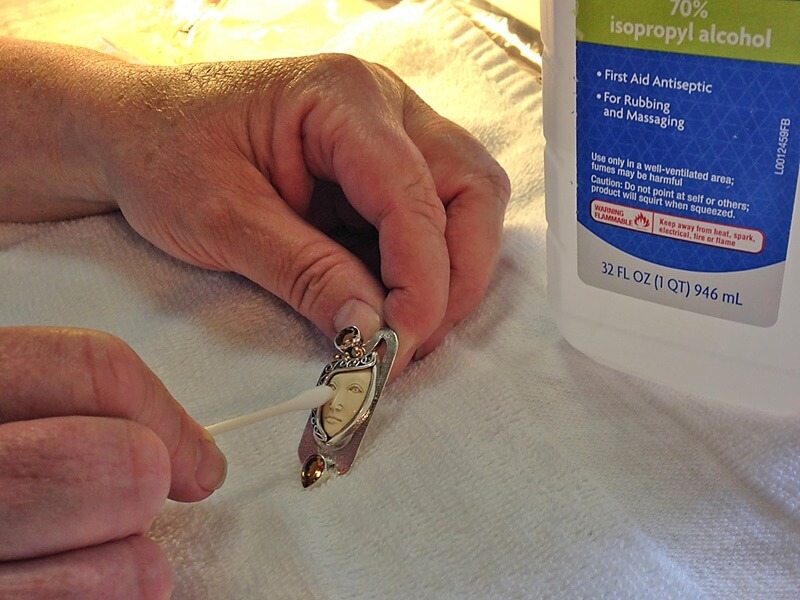 If you pay attention to how your jewelry is stored and follow these simple tips on how to clean ivory, your piece of fossilized ivory jewelry should be well preserved for years to come.